Delivering customers to West Cork businesses every day. The Southern Star is part of the fabric of West Cork life … and has been for over 128 years! Our newspaper, magazines and digital media are enjoyed in thousands of households, businesses, schools, colleges and sports clubs across our region and beyond, every day. Our expert editors, journalists, sales, marketing, digital and design teams are trusted by both readers and advertisers to deliver high quality news, sport, information and creative solutions across our media platforms and that’s why we maintain such a large and responsive audience. If you need to know what’s going on in West Cork, you need The Southern Star! The Southern Star now reaches people across West Cork, Ireland and the world, providing a useful source of information to locals and tourists, plus we keep our diaspora connected to home. We have a large & highly interactive social media audience who we engage with 7 days a week with breaking news, views, sport, information, offers and competitions. West Cork’s biggest selling newspaper stays in households for an average of 5* days, meaning your adverts get seen. Advertising options in News, Recruitment, Farming & Fisheries, Business & Jobs, Property, Lifestyle, Entertainment & Community sections. A range of ad sizes, formats and prices to suit your budget. We publish over 25 magazines each year including Get Active, Weddings, Home & Garden, Farming, Motors, West Fork and Courses & Training … perfect for businesses wishing to target a particular readership. Our ’50 things to see & do’ and ‘Christmas in …’ range of magazines help local businesses target tourists and locals at two key points in the year. Complement your advertising with high impact inserts. A range of formats and geographical targeting options available. We can design and print inserts for you, saving you time and money. Display advertising options across our website www.southernstar.ie. Dedicated Facebook promotions to reach a new audience online and deliver new likes to your page. Video advertising and corporate video options for your business. We design, print and produce flyers, brochures, event programmes, books, posters, logos, adverts, banners, signs, promotional and point of sale items for a range of businesses and festivals. We provide web, social media and online marketing services for businesses and festivals. Visit Star Creative for more information. 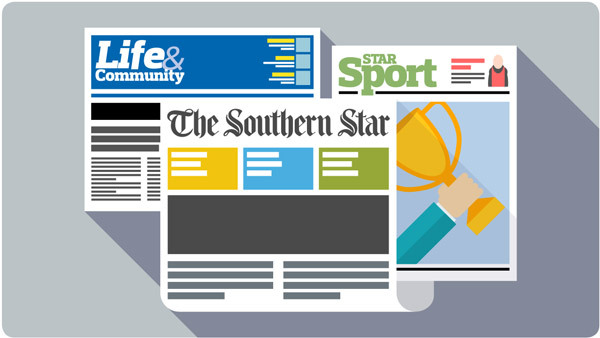 We'd love to hear from you over email, phone or in person and answer any questions you have about advertising with The Southern Star. Please find our contact details below, or fill out the contact form and we'll get back to you.